Sorry folks – this week it’s a bit long! Last week I briefly went into why and how people conduct family tree research, and I explained that I thought this type of study could produce useful source material for writers for creating plots, well-rounded characters or simply to dig you out of a stale patch by fuelling ideas. I want to emphasise that I am not a genealogist (thought about it, couldn’t afford the course!) but I’ve been chipping away at branches of our family tree for many years and have made some progress. So this is not intended as a guide to help you trace your family tree, but as an ideas-file for writers. We all have stories in our families – some sweet and happy – what happened when Granddad proposed to Grandma, how little Jimmy lost his first tooth – that kind of ‘ah!’ moment. But some stories, memories, are dark and painful, even after the passage many years – so please, be sensitive, be careful. At the risk of sounding alarmist, I would also say, if you delve, do it with an open mind – you can learn some awful things sometimes, and what you learn can’t be unlearned. The past is full of real, flawed people, just like us. This week, as hinted, I want to talk about photographs. They are such a great source for anyone, let alone writers! If you are trying to find out more about your family history, dig into the photo albums of the older members of the family. Ask older relatives what they remember about their childhood or stories their parents and grandparents told them. They probably think you already know it all – we have a habit of thinking our memories are common, not unique, and once your oldies have gone, so have their stories! When looking at photos, remember to check the back – people often make a note of who and when – but not always. Sometimes you need to interrogate people, and if that fails – you’ll need to make your best guess. After all, when writing a story, unlike genealogy, the truth doesn’t really matter! Or rather, the truth can be whatever you say it is. Scary thought. In last week’s blog, I used a photo from my stepfather’s parents’ wedding, which took place on 31st July 1920, ‘somewhere’ in Liverpool – Walton, I think it was. I’ve got an address some where if you want it. Looking at the photo, what do we see? First we look at the clothes. If we didn’t know the era, we could make a good guess, based on the style of clothes, the flowers, the setting – we can see this is a reasonably well-off working class family. Hot-house flowers for weddings in those days were just for the very well-to-do, so note that those outside the main bridal party are wearing dahlias (I think?) A fairly inexpensive and easy-to-obtain flower for that era, and often seen in wedding photos. Note too, that the era is again clear from the long exposure required for taking the photo – we know that because the kids at front right have moved and so appear blurred! In another of these pictures, they are even more blurred. Blooming kids can’t keep still! Immediately our eyes are drawn to the bride and groom, in the front centre of the group. She really does look completely peed off, doesn’t she? When I knew her, she was a feisty old girl who tucked her skirt in her knickers and tried to get me to climb over a fence to scrump apples. I was a well-behaved(ish) 12 year old, shocked and horrified, and she was a bad old 76 year old who outran the farmer. She always did what she wanted. She never had a good word to say about Len. Poor old Len. They were married for over 60 years. And hated each other, yet died within weeks of each other. So you see, my real life memories colour my view as I look at this picture, I see both the past and the present captured in that moment from 1920. Len looks pretty pleased with himself. He always went his own way. He tamed rats in the trenches at Gallipolli. He drove through Wales on a motorbike in the 1920s, with Hannah (Betty, as she was always known) riding pillion. She fell off at one point – he didn’t even notice. He kept going until overtaken (I’ve always wondered how? Must have been the slowest motorcycle in history!) by a lorry. The driver yelled out, “yer’ve lost yer tart!” She was still sitting in the road when he went back to look for her. Her mother looks pleased – Hannah Young nee Fawkes – third in from the left, directly behind Len. Maybe she was like Mrs Bennett, and just glad to marry off a daughter? Her husband, Joseph Young is next to her, and although he was a foreman in a factory in South Shields, he looks like he will be glad to get out of that stiff collar and relax a bit. I’m guessing he just wants it over so he can get to the pub. Now his wife’s family, the Fawkes’ – family rumour is that they were descended from THAT Fawkes, and changed their name at one point to avoid the association – and the fallout. Still waiting for proof on that. But they were Catholic, so that’s a start. Leonard’s parents are the ones in dark clothes at the far end of the same row. Evan Francis Brown was a piermaster in Liverpool, having been from a seafaring family. And yes, he had a brother named Pacific Brown – no prizes for guessing where he was born. This I have managed to trace – so here we have anecdote coupled with paperwork – so a firm ground to build a story on. Grace, Evan’s wife, looks a little camera shy to me. But we’ll come to her in a moment. For me the most interesting part of this whole photo is the person taking a sneaky-beak out the window. Who is that? Why didn’t she come out for the photo? It’s definitely a she – you can see her blouse or apron, and maybe a necklace? Was she shy? Was she busy bringing in sandwiches to the dining table, dragged into the front parlour for the special day? Or is it a neighbour, just helping out? I want to know! Once you spot her – either immediately or after a while – it’s hard not to be aware of her. For me it’s as if the photo is only about her. Because she is shrouded in mystery, she has come to dominate the photo simply by not being part of it. Who was she? Moving now to look at the photo at the top of this page, it’s another one of Leonard – my favourite picture, actually. 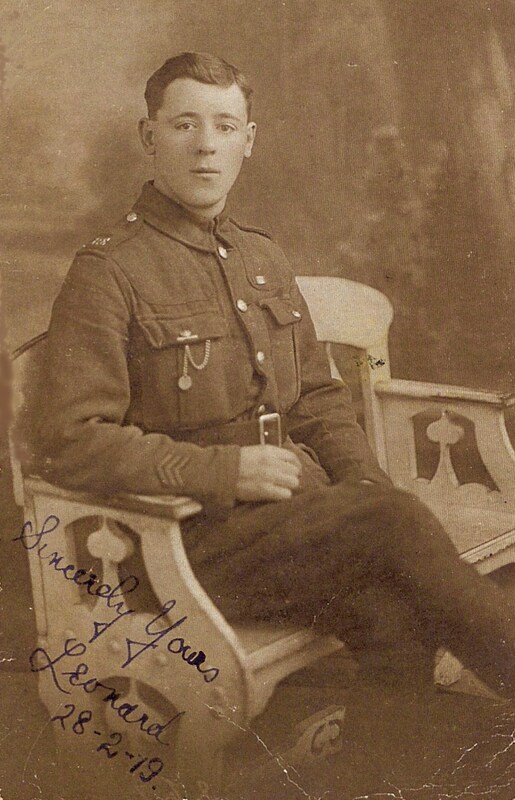 I know many people who had ancestors of ‘that age’ in the 1910s and 1920s have these kinds of photos – they were taken as mementoes for loved ones and sweethearts, usually when going off to war. This one is dated 1919 – so maybe he had it done when he got back – he came home on a hospital ship late in 1918, don’t know why, maybe malaria or something. Or maybe he had it done earlier but only signed it in 1919 when he had someone (Betty/Hannah) to send it to? For the family historian, these types of photos are fabulous evidence. You can gain all kinds of information from looking at the uniform, for example. Sadly this image is not very good quality – mainly because it’s a) old and b) a scan of a photocopy! But I look at it and see – as you probably do – a young man, good-looking-ish, in his early 20s (born August 1896), and looking, I feel, quite at ease with himself and his role in life – maybe because he survived? Or maybe because he was going on a great adventure to the other side of the world? Lots of lads then thought the war was exciting and noble. He also looks a bit Everyman, just an ordinary lad, doing what they all had to do in those days. 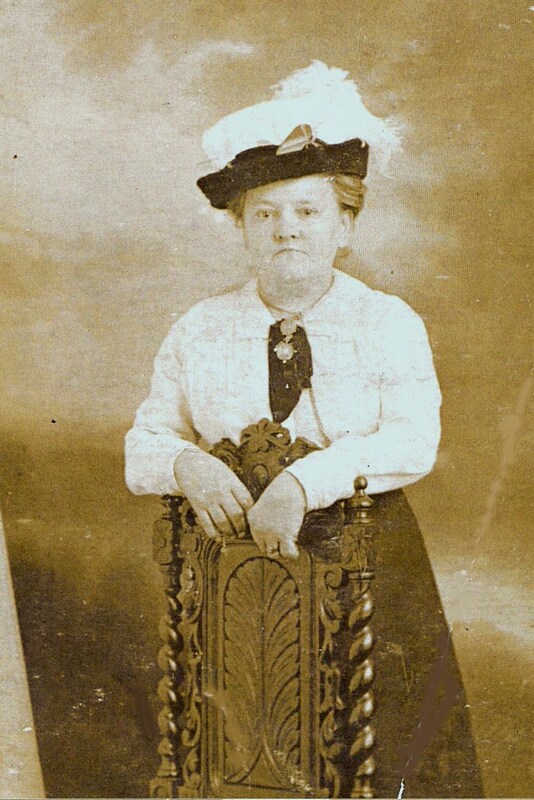 The picture of Grace Brown, nee Roberts, is very similar in ‘tone’ to that of her son. I don’t know if it was taken at the same time. I also have one like this of Evan. Grace captures my imagination though. She looks nervous to me. She is a small, neatly dressed lady in the late Edwardian style, (loving the hat!) We know she is small because the back of the chair comes up almost to her bust, though it’s obviously a high-backed chair. She is wearing a nice pendant on her scarf, it could be a medal of some sort – these were fashionable in the late Victorian era and into the Edwardian age. Her hands show signs of arthritis. She looks ill at ease, probably she is not used to being in the spotlight. She was the mother of a large family, and she was born in Liverpool in about 1860. Somehow I feel sorry for her when I look at this. I feel she posed because she was expected to do so, maybe to give a photo to her son(s) going off to war. Maybe she is thinking how real at all suddenly seemed, with little preparations being made for the big day when they actually ‘go’. Maybe she is afraid she won’t see her boys again. I’d like to be able to reassure her on that score. She is, I think, composed but anxious. She’s not quite leaning on the chair, but I think she’d like to, certainly she is sheltering behind it. But then again, maybe she was nag, a heartless, scheming woman, cross-grained and tetchy. Maybe she didn’t care two straws about her kids. We don’t know for sure. But t me – she will always be a nervous, shy woman, not used to being photographed. She died in the early 1940s, during another war. Looking at old photos can give you ideas. They are not drawings – they are captured images of actual people, even when they are posed. What do these photographs tell you? Who do you see? Look closely, the story’s there. NEXT WEEK: Read All About It – history in the news. Getting Sherlock Holmes like there Caron, 🙂 and it’s the way to be doing family research. You have to look at every little thing. Grace’s hands have certainly seen a lot of clothes washing. I saw the woman in the window in the previous post. Love that, ‘yerv lost ya tart.’ Priceless. Looking forward t next week.